Great for large families or several families. Five bedroom, beautifully furnished house only two blocks from the ocean with a sweeping ocean view. Large community pool across the street (20 feet) from the house - watch the kids play in the pool from your own deck. Five minute walk to the Town Center of Rosemary Beach (Restaurants, Coffee Bars, Shops). Huge decks (three total - one on each level) are perfect for outdoor dining, relaxing and watching the ocean. Two king-size beds, two queen-size beds, and two bunk beds, will sleep 12 people. First Floor - master bedroom , one and a half baths, kitchen, living and dining area. Second Floor - king bedroom, queen bedroom, bunk room, two baths and huge deck. Third Floor - queen bedroom, one bath, sitting area and huge deck. Beautiful views from upper decks - especially the 3rd. Beach access from 2 locations within 100 yards of house. One from path behind pool, 2nd from street access. Parking is available for 3 cars on property. Beach toys are available for use. (3) 3 decks - 1 on each level. Beautiful views from third floor deck. Pool is directly across street from house. 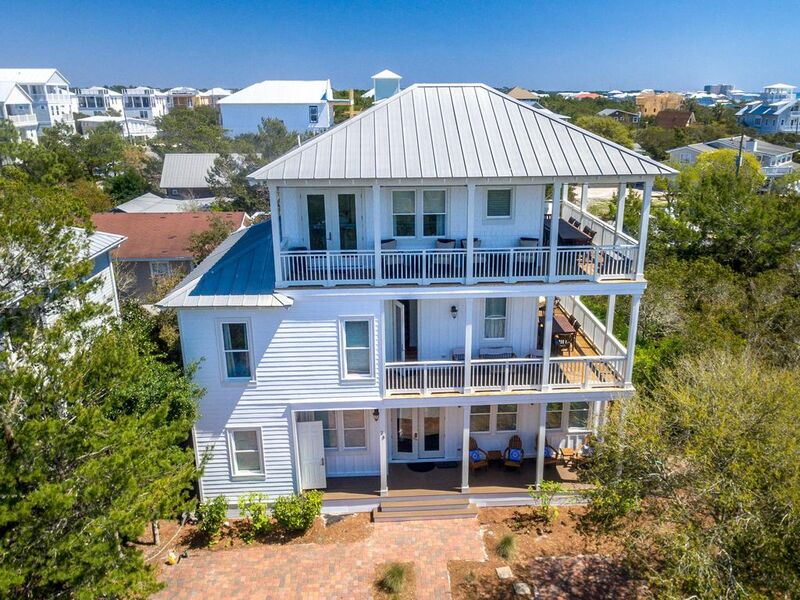 The 30A area is becoming more popular each year. Along with this comes a higher demand for housing, restaurants, shops, etc. as well as local community projects to accommodate the growth. There is a high likelihood of nearby construction, home remodeling, community upgrades as well as road and bridge construction leading into the area. Please be aware that refunds will not be issued due to noise disturbances or unsightly views due these projects. Great location, well maintained and stocked. Review title says it all, plus owner was responsive and easy to deal with. We had six adults and four children. The house was perfect for us. Would definitely rent this home again. The home is nicely furnished and the location is perfect. The pool is a straight walk out the door across the street. Our kids and adults loved it. Each morning we took the very short walk to the beach and spent time playing and relaxing. Our family was 6 adults and 2 children and we all had plenty of room in this spacious home. My wife already wants to book this home for our next year vacation. John the owner was great and very helpful. Thanks for a wonderful stay. We loved staying at this Inlet Beach house. The owner was very attentive, sent information regarding the summer calendar of events for the So Walton area, and the proximity to the beach and Rosemary made it enjoyable for all. We were able to try Cuvée at 30a and Big Bad Breakfast both within walking distance. Thank you! This property is everything we hoped it would be! About 1 1/2 blocks from the beach and located on a nice, quiet Cul-de-sac with brick paved street. It had all of the amenities you could ask for including bikes for everyone to ride. Everything was clean and well maintained when we arrived. It is convenient to everything you need, seafood, groceries and restaurants. The community pool was right across the street and was very seldom occupied. We thoroughly enjoyed our stay and hope to maybe come back to this same location next year. We had ten people stay for a week in this fabulous home. Our older parents stayed on the main floor master, which was great for them, so they didn't have to walk up and down the three flights. The bunk room was perfect for the kids and the other bedrooms all had nice big beds. We loved the wrap around porches in the morning and evenings. The pool was literally across the street and only for the few houses on the street. It was pretty much like having our own pool. The beach is a short walk and the closet was packed with beach items, such as chairs. There were four bikes for our use. Unfortunately, two of them broke, but owner was very responsive and sent son in law to come pick up and leave two new bikes. The kitchen was well stocked with everything you could need. There was even supplies such as dish soap and paper towels to get us started. The house was very clean and the overall process of renting was incredibly easy. We felt like it was a great vacation and the owners were very kind and responsive. Would definitely recommend this home!